That’s the intriguing way that Brie Anne Eichhorn describes her experience as one of the 3 million young people who joined Pope Francis in Rio de Janiero on July 23-28 for World Youth Day. “I describe it that way because I had expectations for this trip that I didn’t even know I was having, and those expectations were completely torn apart,” said Eichhorn, a member of St. Joan of Arc Parish in Indianapolis who was one of 32 young adults from the archdiocese to travel to Brazil for World Youth Day. And yet from those moments of seeming disaster came a beauty that deepened her faith. That feeling came to life in an even more intense way for her when she participated in eucharistic adoration with Pope Francis on Copacabana Beach with millions of other young Catholics. That feeling resonated among the pilgrims from the archdiocese. 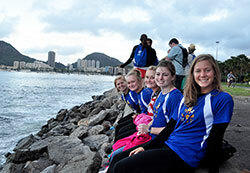 Here are some of their thoughts and memories of World Youth Day. One of the most inspiring and touching moments of the experience for Father Jonathan Meyer came when he translated the words of Pope Francis for his group. “I brought a radio and headphones to tune into the local radio station that was set up for English translations of the papal events,” recalled Father Meyer, pastor of the Jennings County parishes of St. Ann, St. Mary and St. Joseph. “I was the only one in our group that had a radio, so at the events I would listen to the translation and then speak the words to all those around me. Transitional Deacon Timothy Wyciskalla was awed by the size of the crowds, their international flavor and their behavior in the midst of difficult conditions. “Crowds that large, especially when they are exhausted and bottlenecked as we were—sometimes waiting hours to move out of Copacabana beach to get back through the city—can often become dangerous and angry. At World Youth Day, the only thing the crowd did as we moved slowly and relentlessly through millions of people was sing songs from their home countries and pray the rosary in every conceivable language. “One of the most powerful moments for me came during the final Mass. Countless people and national flags filled the world’s most famous beach. And yet, when Pope Francis arrived, all the flags went down, the international crowd became a single family of faith, and everyone knew exactly when to stand, when to kneel, and when to offer the sign of peace during Mass. Matt Faley regularly gets to witness the commitment of young Catholics to their faith as the archdiocese’s director of young adult and college campus ministry. World Youth Day strengthened his commitment. “It stretched my heart in a big way. It reminded me that our Church is full of hope. Working with young adults, I get to see this every day. It is one of the great blessings of my life. But being with 3 million Catholic young people who are on fire for our Lord and his Church has an impact on you that is lasting. For Father Eric Augenstein, the memories of World Youth Day are etched in his mind. Now, his focus is on how that whirlwind week will have an impact in the archdiocese. “At the end of World Youth Day, we all have to go back home—to return to our regular lives, jobs and ministries,” said the vocations director for the archdiocese. “For me, having the opportunity to spend World Youth Day with a group of young adults from the archdiocese is what gives me the greatest hope for our local Church. These young men and women from the archdiocese are people of inspiring faith, strong Catholic convictions and a zeal for service.